Put the pedal to the floor and let the new DigiTech CabDryVR Speaker Cabinet IR pedal take you where you want to go. Featuring a selection of 14 great-sounding guitar and bass cab Impulse Responses. The CabDryVR allows you to run direct from your pedal board to your DAW, mixing board, or in-ear monitors with no compromise in tone. The CabDryVR has dual input and output, and a dry path to run to your onstage amp or monitors. 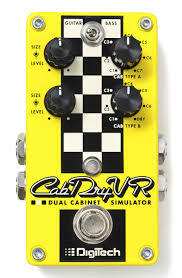 The CabDryVR also has patented Cabinet Tuning control to ad-just the depth of the cab, and an output level control on each channel. You can also run separate IR models on each channel just like mic’ing up two different cabinets. It is true bypass so it can be taken out of the chain when using piezo pickups. This CabDryVR is for hire.